As a faithful family member, your dog has all the rights to ask for the help when he is old or becomes disabled. This adorable animal gives you unconditional love, real care, and loyalty like no one can! So, dogs also deserve to be loved, cherished and respected, even after getting any disability. 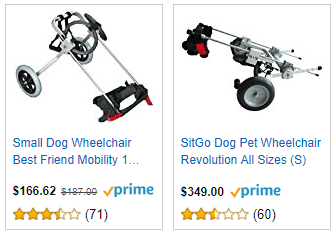 In our site – Pet dog wheelchair – we provide all the tips, ideas, importance and reviews regarding various wheelchairs and comfortable carts for your lovely pet. Here you can get a range to know, understand and buy some extraordinary wheelchairs and benefits of using them. Moreover, you can also get guidelines regarding the same. When a dog, being man’s best friend doesn’t walk or move properly, it is a sad sight. But luckily, there is the option of a dog wheelchair or dog’s cart to give life into his step! It is an amazing invention. If your canine is suffering from problems regarding mobility, the wheelchair is the best solution for him. It gives him the ability to thrive. According to the medical experts, Degenerative Myelopathy (DM) – a condition which affects a dog’s spinal cord – slowly decrease the ability of walking and takes the feeling of mobility away from some of the part of the dog’s body. Usually, it affects the back legs of the canine. A cart is an appropriate thing to help your favorite dog. If your dog is suffering from permanent, or temporary disablement, else having effects of old age, get such wheelchairs according to the need of your dog’s comfort. Wheelchairs or carts can be used to lessen the pain caused by various issues like arthritis or slipped discs. Such carts also can help him in the recovery from the severe surgery. We – as a team, do extensive research and post accordingly. We hope you will find this site useful and helpful for your pet dog. Contact us if you want any further information about the wheelchair or any other help regarding to your dog’s health.